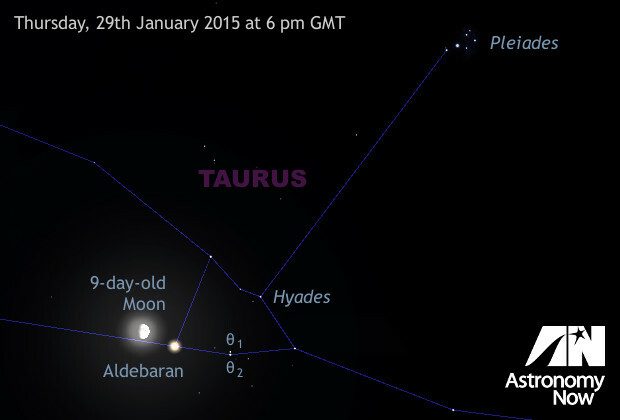 Once twilight fades on the evening of Thursday, January 29th, observers in the British Isles can see the gibbous nine-day-old Moon less than 1° away from Aldebaran in the constellation of Taurus. 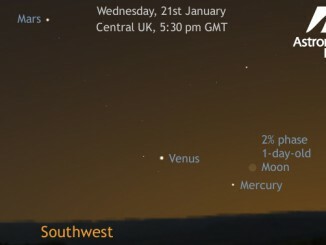 While no occultation of the star will be visible from the UK, the pair will be close enough to be seen in the same low-power telescope field of view. Observers with binoculars — particularly of the low power, wide-field variety such as 7x50s or 8x30s — can also see the V-shaped Hyades cluster in the same field of view. Note that the field is strewn with interesting wide double stars, particularly in the vicinity of naked-eye pair θ1 and θ2 Tauri. While you’re in the vicinity, don’t miss the beautiful Pleiades open cluster, two binocular fields away to the upper right. Clear skies! 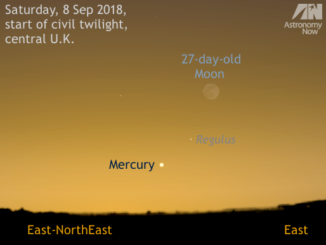 What’s the youngest Moon you’ve ever seen? 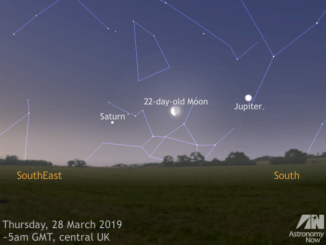 While the best opportunities generally occur in Northern Hemisphere spring when the ecliptic’s high, 21st January offers UK observers a 28-hour-old lunar crescent.